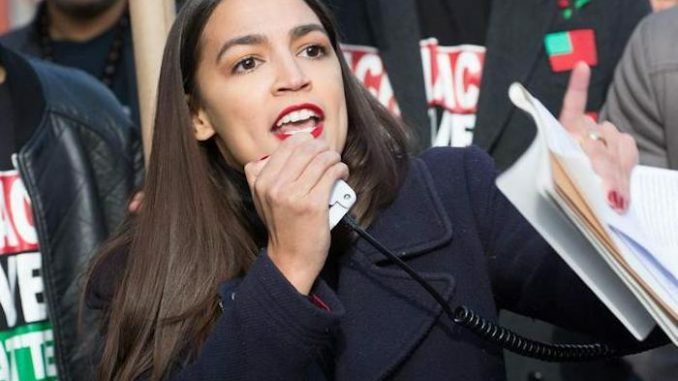 Ocasio-Cortez was questioning Wilbur Ross, President Donald Trump’s secretary of commerce, when she made the bombshell statement. She began by referencing remarks Republican Kris Kobach made while he was Kansas secretary of state. Kobach encouraged Trump early on in his administration to add a 2020 consensus question about citizenship. Freebeacon.com reports: Ross acknowledged he did speak with Kobach early on in the administration, but he was cut off by Ocasio-Cortez before he could clarify what exactly the conversation was about. “Mr. Kobach later sent an email to you on July 14, writing that the lack of the citizenship question ‘leads to the problem that aliens who do not actually reside in the United States are still counted for congressional apportionment services,’” she said.